Powers/Abilities: Mrrungo-Mu possesses Class 100 strength and durability. He can drain power from others to increase his own: initially, he directly draws their powers into him, but he then has them hooked into machinery that continually beams him power. Enhanced, he is immensely powerful, possessing incalculable strength and vast energy powers, and can teleport and form shields, and is virtually indestructible. He was unfazed by slashes from Wolverine's claws and he simultaneously pummeled the Hulk and Namor, as well as a whole group of powerful heroes. At his peak, he is even more powerful than the Silver Surfer; even mighty Galactus avoided a conflict with the Enslavers while he was weakened by hunger. (Silver Surfer: The Enslavers (fb) - BTS) - Mrrungo-Mu was the lover of Tnneya. (Silver Surfer: The Enslavers (fb) - BTS) - The Troxx that would become the Enslavers once dwelled on a dying planet. Mrrungo-Mu, whose inherent great power is of unknown origin, led his people to conquer and enslave others, draining their victims power to supplement their own, thus enabling them to conquer and enslave greater and greater numbers. By this means, Mu saved his race from extinction. Initially he did what he did to save his people; however, eventually the savagery needed to accomplish his goals, as well as his lust for ever greater levels of power, drove him mad. (Silver Surfer: The Enslavers (fb) - BTS) - Led by the power of Mrrungo-Mu, the Enslavers conquered world after world. Prisoners of the Enslavers were hooked into machinery that constantly transmitted their power to Mrrungo-Mu and to the Enslavers' starship. 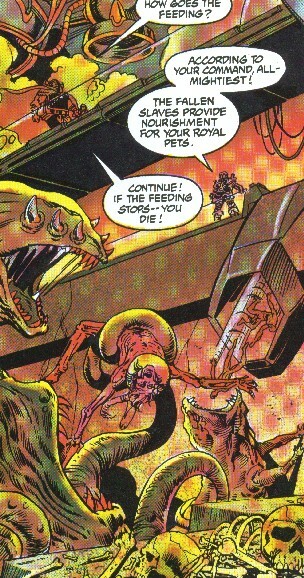 After the energies of the captives were exhausted, their corpses served as nourishment to Mu's monstrous royal pets. (Silver Surfer: The Enslavers (fb) - BTS) - Mu possessed a large harem, but he kept Tnneya as his chosen woman. However, despite his vast physical and military power, and the immense wealth he showered upon her, she hated what he had become, and she denied him her affections, as she sought two things he no longer understood: love and tenderness. (Silver Surfer: The Enslavers (fb) - BTS) - The Enslavers arrived, causing Galactus problems in finding suitable planets to consume. (Silver Surfer: The Enslavers (fb) - BTS) - The Enslavers conquered Zenn-La, enslaving its populace. Shalla Bal was chosen to be amongst Mrrungo-Mu's harem. 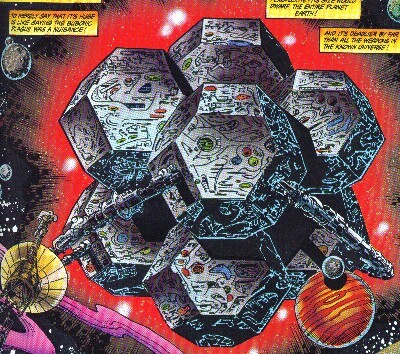 (Silver Surfer: The Enslavers) - Voyager III, the space probe sent from Earth years before, was launched an unknown distance at great speed by Galactus. It approached and was pulled via tractor beam into the Enslavers' ship. From this, the ship's scientists deciphered the Earthly message of peace and then used its long-range scanners to locate Earth. They transmitted a message discussing friendly contact, which was ecstatically received by Voyager's designer, astrophysicist Earl Weygand. However, while Weygand excitedly discussed the message on television, the Enslavers' soldiers struck, ambushing and capturing the super-heroes and super-villains of Earth. To prove his power, Mu released a group of heroes--Colossus, Doc Samson, Hulk, Namor, Rogue, She-Hulk, Silver Surfer, Thing, Thor, and Wolverine--and then easily incapacitated the lot of them. Despite these recent additions, Mu's elder engineer Kalldin-Zo pointed out that their massive ship required greater amounts of energy, energy that could only be provided by capturing greater numbers of slaves. Mu vowed to continue conquering worlds and taking ever more slaves, but he warned Zo that he would die most painfully if the power stopped. Mu visited Tnneya, who continued to deny her affections. Pushed to the limit, Mu teleported away, telling her that when he returned, she would welcome him properly. Tnneya fled the Enslavers' ship in her private yacht as Mu surveyed a new group of dancers, which included Shalla Bal, whose free will and emotion Mu began draining. Mu was furious upon learning of Tnneya's departure, commanding the deaths of both the flight master and the one who brought the message and then ordering that Tnneya be safely returned. The Silver Surfer, who had been investigating a vision of the Zenn-Lavian's enslavement, came across the fleeing craft of Tnneya and rescued her, disabling the ship pursuing her. The grateful Tnneya was strongly attracted to the Surfer, and she took the form of Shalla Bal, seducing him. After some...romance, the Surfer realized that Tnneya was not Shalla Bal, and she returned to her true form, exclaiming his strength in spirit and love, but expressing sadness that Mrrungo-Mu would destroy him. 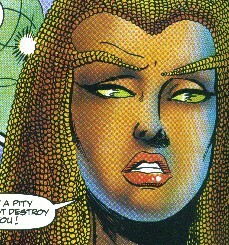 The Surfer disregarded her warnings of Mu's power and convinced her to direct him the Enslavers. Upon learning that Mu was targeting Earth, he took Tnneya and accessed warp space to confront the Enslavers as soon as possible. Meanwhile, the Enslavers sent crafts to Earth, using giant suction devices to capture and enslave the whole population who were then placed in individual life support capsules and stored in gigantic holding chambers, to be preserved until needed. Mu took up temporary residence in the United Nations Building, and he summoned Earl Wygand, thanking him for leading him to Earth and granting him the reward of one week of freedom. Mu's advisors soon warned him of the Surfer's approach; intrigued by the prospect of testing the power of Galactus, Mu had a laser beacon sent to guide the Surfer directly to him. Mu mocked the Surfer, who struck out at Mu's soldiers, but Mu stopped the fight and ordered all others from the room that he might battle the Surfer unmolested. 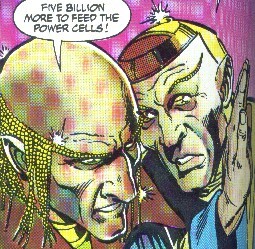 As the others left, the Surfer--having learned of Mu's power plant from Tnneya--transferred half of his power to Weygang, along with the message to use this power to disable the Enslavers power batteries. Knowing that with half of his power he could not hope to stand up to Mu, the Surfer nonetheless fought back with all of his might. Mu toyed with the Surfer, concluding that since the Surfer was such a small challenge to him that Galactus must be his inferior as well. However, Weygand managed to destroy the shields around the power plant at the cost of his own life. As Weygand died, the Surfer's full power returned, and he fired a beam into the Enslavers' ship that destroyed the power plant. Though still mighty even without the power channeled from his ship, Mu proved inferior to the Surfer's Power Cosmic, and the Surfer defeated him and then prepared to execute him for his crimes. Tnneya rushed to Mu's defense, revealing that he was a man of unbounded courage and fiery passion, discussing how he had become the Enslaver, and proclaiming her love for him. Moved by her words, the Surfer sent Mu and Tnneya back to their ship, which departed, leaving behind its captives and power cells--never to menace the galaxies again! 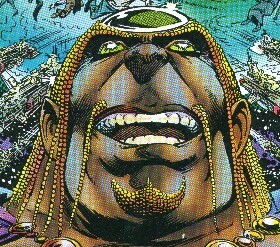 The Surfer cosmically restructured the Enslavers' former Power Plant and containment facilities to form a massive armada of ships, which he and Shalla led to return to their lost worlds. Comments: Created by Stan "The Man" Lee and Keith Pollard. According to Stan Lee, he wrote this back in 1980, then didn't hear anything about it until 1988. Upon reading it, he figured that Keith had lost his plots because it was virtually a different story than he had written. Nonetheless, Stan said he was quite pleased with how it turned out. Mrrungo-Mu says the word "be" too much. I be Mrrungo-Mu. We be the Enslavers. Who be you? Now be the time to break that spirit so you be slaves forever. Since in comics almost every random romantic encounter results in a child, I would think that Tnneya would have born the Surfer's child. Interesting story out there somewhere. 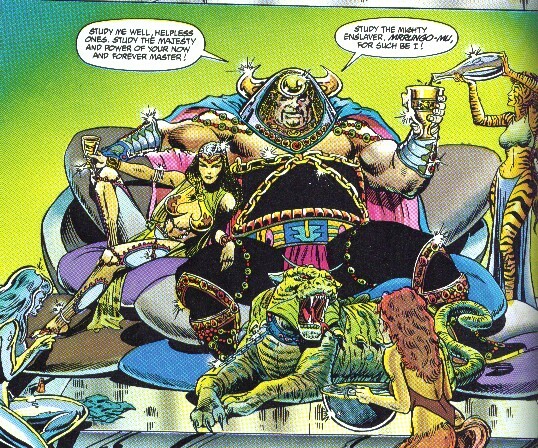 I like the name Choleos for the Enslavers home planet and the Choleon for the name of their race. Weygand seems to have been patterned after Carl Sagan. 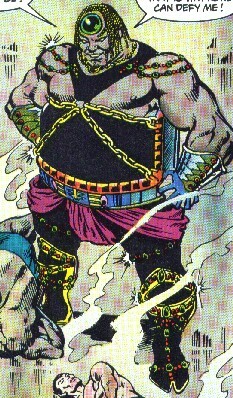 The Enslavers' true name was revealed in their profile (Troxx) in FF: Fifty Fantastic Years#1 (November, 2011). Mrrungo-Mu's race, they were doomed on a dying planet until Mu's power enabled them to conquer and enslave other races, and they drained their prisoners' power, increasing their own, so that they could conquer and enslave ever more victims. After Mu was defeated and stripped of power by the Surfer, the Enslavers left Earth, their power plant destroyed, and it appeared that they would never return. They are grossly humanoid, with beaded structures in place of hair. It is unclear whether they have any other superhuman powers. Beyond Mrrungu-Mu and Tnneya, Kalldin-Zo (Mu's elder engineer, pictured on the right side of the picture to the right) was also named. Immensely powerful while backed by the Enslavers' ship's power plant, soldiers acting individually proved capable of overcoming foes as powerful as Dr. Doom, the Hulk, Thor, Wolverine, etc. They had vast strength, were virtually indestructible, and could fire devastating energy blasts. It is unclear how powerful they are without the power plant's support. The Surfer was not sure whether they were robots or armored men. The worldship could dispatch other ships that, while much smaller, were still large enough to hold entire cities of people. These ships contained powerful vortex devices that could siphon all of the inhabitants of a city while leaving behind anything the beings were not holding. Monstrous creatures, they devoured all captives tossed to them by Mu. 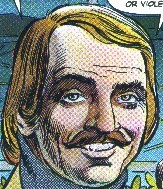 Earl Weygand set them free, using their rampage to distract the Enslavers from trying to keep him from the Power Plant. Most favored and first chosen of Mrrungo-Mu's Royal Seraglio, she described herself as a former princess. She was apparently Mu's lover back before he became the Enslaver. Despite her behavior towards Mu and the fact that she despised what he stood for, she still loved him, and she knew that he loved her in his own way. Nonetheless, after he became corrupted by his power and mission, she began to deny him her affections. When he pressed the issue, she fled, and she was saved from Mu's lackeys by the Silver Surfer. Impressed by his bravery and noble spirit, Tnneya took the form of Shalla Bal and seduced him. After they had been intimate, the Surfer saw through the illusion, and realized that she was not Shalla. He convinced her to lead him back to Mu, and after Mu had been defeated, she stopped the Surfer from executing him, revealing the noble man he had once been, the man she hoped he would be again. Tnneya can either morph into other forms or cast illusions. She may also be able to influence the thoughts and emotions of others. An astrophysicist, Weygand sent Voyager III into space, carrying with it information about Earth, intending to encourage peaceful relationships with any alien race it encountered. The Voyager III encountered Galactus, who acknowledged it and then launched it into deep space. This enabled it to reach the worldship of the Enslavers, which scanned it and then used its information to locate Earth. After the Enslavers captured all of humanity, Mu brought Weygand before him, thanking him for drawing him to Earth and rewarding him for this by allowing him to retain a week of freedom. After the Surfer arrived on Earth to confront Mu, the Surfer transported half of his power to Weygand (transforming his body to match the Surfer's), as well as the message to destroy the Power Plant. Determined to succeed, Weygand flew from Earth to the Worldship, disabling its communication equipment to prevent Mu from being notified, set free Mu's pets to distract the warriors who would oppose him, and then approached the plant. Weygand intended to use his power to survive passing through the shield and then destroy the Plant, but when a number of defense mechanisms began to assault him, he realized that his only choice was to use all of his power against the shield. 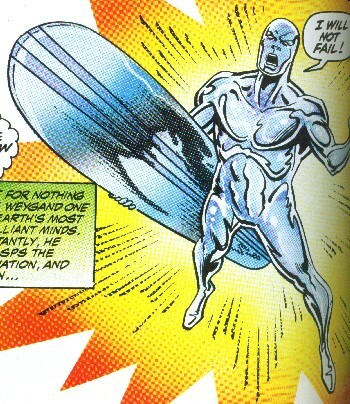 Weygand destroyed the shield at the cost of his very life, but the Surfer's power was returned to its true owner, and the Surfer then destroyed the Power Plant, enabling him to defeat the Enslavers.